The Schedule Copy feature copies one past section of the schedule, whether a day, week, or month, to a future date. 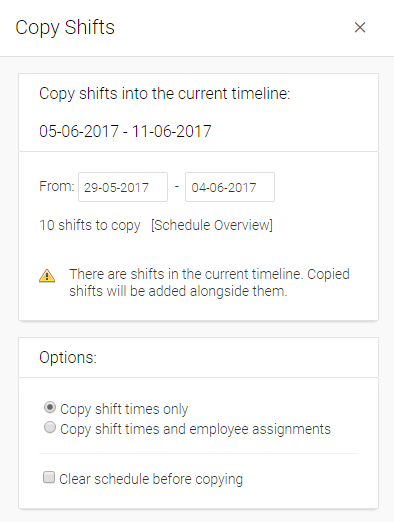 In essence, the past schedule can be used as a template to copy shifts into a future date which then can be adjusted as required. Let's say you want to copy the below schedule to the next week. First, go to the tab ShiftPlanning and find the date and show the period, weather by the day, week or the month, that you want to copy to. In this case, just navigate to the next week and note the blank schedule where the schedule information will be copied to. 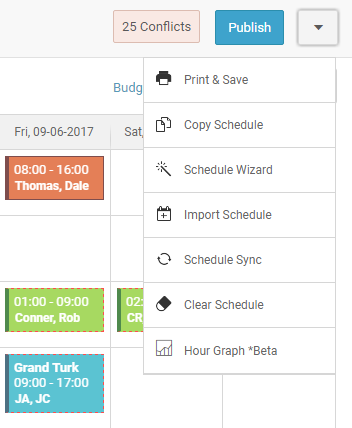 To copy a schedule to that period simply click on the downward arrow icon beside Publish button and select Copy Schedule. First, notice the dates. You can click the From date and select another date where you want to start to copy from. This goes up to the day that is just before the date that you will be copying to. If you want to change the end date click cancel and navigate to that date on the schedule and click the Schedule Copy option again. Clear schedule before copying: this option will clear the schedule from the week where you are copying your schedule. After that, click Copy Shifts.